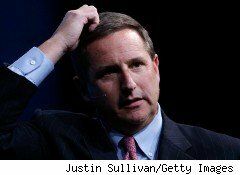 Hewlett-Packard (HPQ) Chief Executive Mark Hurd's sudden resignation last Friday stunned the technology world and marked a dramatic fall from grace for the operational wizard widely credited for reviving HP's flagging fortunes and returning the storied firm to its proper place as a Silicon Valley leader. Hurd resigned after the board found he violated company policy by trying to conceal payments to a contractor -- the actress and reality show contestant Jodie Fisher. Hurd's departure sent HP shares tumbling over 8% Friday. On Monday, the company's stock fell another 8%. But despite the uncertainty, several analysts surveyed by DailyFinance feel the company is operating well enough to weather the storm as it looks for a new CEO. "This is obviously bad for Mark Hurd's reputation and it's unfortunate for HP, but it's something the company will get past," says Shannon Cross, an analyst with Cross Research. "Investors are taking a hit from having a very, very experienced CEO departing, but the company is fundamentally sound," says Lous Misciosia, an analyst at Collins Stewart. Richard Kugele, an analyst at Needham & Co., is also optimistic about the company's future and urges investors to look for buying opportunities. "Despite the shock at the loss of tech industry titan Mark Hurd, we remain convinced of both the near and long-term potential of HP," Kugele wrote to clients Monday. "Investors can often capitalize on moments of the greatest upheaval, and this is one of those times." With no succession plan in place, according to one analyst, HP's board must now assemble a list of possible candidates both from inside and outside the company. Chief Financial Officer Cathie Lesjak has taken over as interim chief executive, but has no designs on permanently assuming the role of CEO, according to the company. Jayson Noland, an analyst at Robert W. Baird & Co., says that of all the potential candidates, Todd Bradley, executive VP of HP's personal systems group -- the $42 billion mobile and PC business -- is the odds-on favorite. Bradley served as Palm CEO from 2003 to 2005 -- arguably the mobile company's golden years -- before joining HP, and is credited with engineering HP's $1.2 acquisition of Palm. "Nothing's broken, there's a system in place, so it wouldn't be surprising to see Bradley become CEO," says Noland. "He's cut from the same cloth as Mark. He's an operations guy and I would assume they want to keep that focus given how big the business is." Dinesh Moorjani, an analyst at Gleacher & Company, thinks that after reaching outside the company for the last two chief executives -- Carly Fiorina and Mark Hurd -- HP's board will look internally, given the company's solid executive bench. "My guess would be this time around an internal candidate is more likely because the board has signaled there will not be a material change in the strategy," Moorjani says. Like Noland, he thinks Bradley is the front-runner, although he rates Ann Livermore and David Donatelli as top candidates as well. Livermore is executive VP of HP's enterprise business, and Donatelli is executive VP of enterprise servers, storage and networking. Bradley is particularly well-positioned because of his experience in the mobile business, an area that HP is aggressively moving into. "HP is a little late to the game but what they're trying to do is very ambitious," says Moorjani. "They bought Palm for $1.2 billion, but they're going to spend a lot more than that on mobile. It's a high-risk move, but if they're successful they will see high reward." Hurd, who serves on the board of directors of media conglomerate News Corp., is credited with reviving HP -- the grandfather of Silicon Valley tech firms -- after Carly Fiorina's tumultuous run as CEO and the highly controversial merger with Compaq. Hurd cut costs, streamlined the company's vision and operations, and helped it move beyond an ugly scandal where the firm was caught spying on board members and reporters in an ill-conceived effort to ferret out corporate leaks. "Mark brought discipline to the firm in 2005 with a system where objectives are measurable and people are held accountable," says Noland. "Now, HP is headed in the right direction. They have the lowest cost structure in industry and the best potential for data center conversion. When you look at the server market, the storage market and the networking market, HP is a leader in all three." Kugele says it's still too early to tell whether HP will opt for an internal candidate. "Given how HP is like running a small country, the board needs to be extra diligent, and that means looking both in and outside the company." With the company executing well right now, HP's board has the time to do a thorough search, says Misciosia. "The impression I had was there was not a succession plan," he says, "but HP is fundamentally sound and the product strategy is working, so the company could run on auto-pilot for the next six months while conducting a diligent search."